When I managed the E.P. 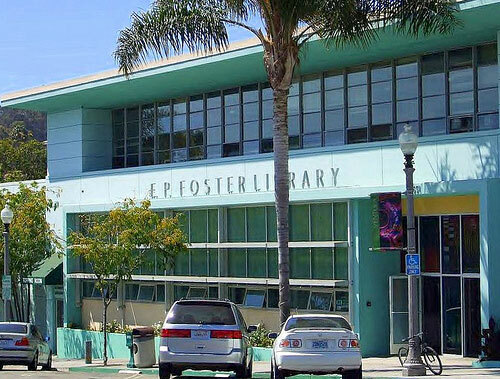 Foster Library in downtown Ventura we had many library users that were part of the homeless community. In 2008 I joined the Ventura Social Services Task Force and subsequently learned about the various local resources offered to this underserved population. One of the most effective organizations was The Turning Point Foundation. One Monday around noon, an irate patron approached me. He said that he was an ex-Marine. He considered himself able to handle just about anything, but pointed to a person seated nearby and told me that the man reeked, that I’d better do something or he would. I didn’t recognize the “offender” as a library regular and thought he might be new to the area. Before approaching him, I called Our Place (now Our Place Safe Haven) and made sure they were open and that their normal services were available. I also drew up a little map about how to get to Our Place, just a couple blocks away. He was seated in a low upholstered chair. I got down on my knees, introduced myself and spoke quietly to him. I explained that I had received a complaint that his clothes might need a good cleaning. Did he know that there was a place just a couple blocks away where he could do his laundry free and take a shower? No, he didn’t. I explained about what Our Place was and told him to check it out. The next Wednesday, two days later, a clean shaven, clean cut man came to the library to speak to me. He said he’d been to Our Place, cleaned up himself and his clothes, and had a referral appointment with a case worker the next day. I didn’t recognize him. This was the beginning of a life change for both me and for the man, who I learned was named Francis and was also known as Frank. Working with Corliss Porter of Turning Point, I followed what was happening in his life. He was a veteran. He was eligible for veteran benefits, including health care. He had serious unattended health issues but within the year was able to get the operation he needed. And, most importantly, he was able to get off the streets. I am retired now and living on social security and a small pension. One of my most important charitable donations is to The Turning Point Foundation. There are hundreds of people like Francis in our community. They need our help.